Every year, tens of millions of Americans participate in the ritual that is spring cleaning. At least 72 percent of the households in the UnitedStates perform some variety of spring cleaning every year. In light of that activity, there’s plenty of money to be made off of all the commotion. Here are a few great ways to earn extra cash this spring. Believe it or not, selling digital downloads on Etsy is an easy way to make money hand over fist if you deliver a great product. Come up with a few handy spring cleaning how-to guides and checklists, embellish them with a couple of photos or graphics and upload them to the site. If you have plenty of quality used clothes that you can’t see yourself wearing again, you can make a ton of money by selling them off wisely. There are plenty of great sites that facilitate these kinds of sales like Tradesy, Vinted, Poshmark, ThredUP and Twice. List your clothes, sell them online and profit. Probably the easiest way to unload old gear and make some money in the process is with an old-fashioned yard sale. The key to yard sale success is advertising the event. Use Front Porch and Craigslist to generate interest before setting out the card tables. Try to get a few neighbors in on the action to diversify offerings. Consignment stores can be a goldmine if you’re willing to wait a few weeks or months for your gear to be sold. If store proprietors aren’t willing to offer attractive terms, just sell your items online individually. Be sure to read the terms of your consignment agreement thoroughly before agreeing to any given arrangement. If you’re great at cleaning up your own domicile, you can build a thriving business by planning out spring cleaning sessions for others. Start by offering a pro bono consultancy session or two to your close friends. Print up some business cards and have former clients vouch for your abilities when it comes to organizing and cleaning. Every spring, sales of cleaning products go through the roof as homeowners and renters seek to purify their living areas. You can make a pretty penny by stocking up on those cleaning supplies in the fall and selling your inventory at a markup. Try to specialize in organic or all-natural supplies to significantly bump up profit margins. Spring cleaning often requires homeowners to move a lot of furniture. Unless you have a van or an F-250, moving heavy items is a tough task. You can make life easier on spring cleaners and profit greatly by doing the grunt work for them. All you need is a big vehicle and a few hired hands to get started. For parents, spring cleaning is twice as hard since they have to keep the kids safe and entertained while getting real work done. You can give those stressed parents a hand by setting up a temporary daycare for their tots. Child-proof your home, stock up on Lego kits and watch the kiddies for a healthy fee. If you’re executing a massive spring-cleaning operation, pets are even worse than kids when it comes to complicating the game plan. A pet-sitting service is a godsend for busy homeowners that just want their beloved dogs and cats out of the way for a little while. If you’re an animal lover, this idea is an easy one to pull off. When people move quality furniture around, it tends to get dinged up in a hurry. That’s why a furniture restoration service aimed at spring cleaners is such a great idea. All you need is a few sanders, some varnish and the knowledge required to make old furniture look like new again. Whether you’re a high school student or you’ve been out of college for 20 years, you probably have unused textbooks lying around. Use a site like BookScouter to move the old merchandise quickly on the web. You can take this idea a step further by buying old textbooks via Craigslist and flipping them for a profit. Most people don’t realize how valuable the old washers and dryers in their garages can be to scrap metal dealers. What’s more, that valuable metal sits there for years because it’s a pain to move. Offer to pick up old appliances with a lot of metal in them for free and flip them to recycling companies. Every smartphone and tablet on the planet is worth at least a dollar since they contain precious metals like gold, silver and platinum. You can make a ton of money by picking up old electronics and flipping them to e-cycling companies around the country. Selling old iPads to local computer repair shops that will cannibalize them for parts is another viable option. A big part of spring cleaning is finally taking care of your car or truck’s interior. If you buy a decent shop vacuum, some quality cleaning supplies and a few chamois cloths, you can make house calls and rake in up to $50 for an hour of work. Detail your own vehicles first to develop your skills before getting started. While it may be an annual tradition, spring cleaning is a pain in the neck that most adults don’t particularly enjoy. You can make a ton of coin by hosting a great shindig complete with food, drinks and entertainment. As long as you advertise well in advance, you can charge $10 or more per attendee. 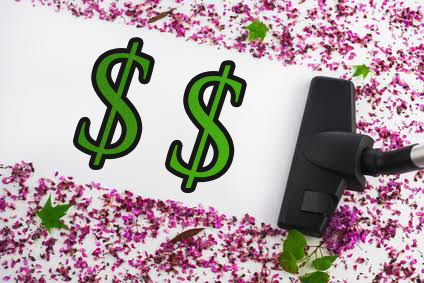 Ultimately, there are a million ways to make a quick buck from the spring cleaning season. The best option for you depends on the equipment that you have handy, your time constraints and your level of motivation. Any of the aforementioned ideas can be quite lucrative no matter where you live.